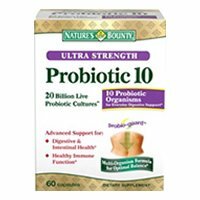 Detailed review of Nature's Bounty Probiotic 10. See how this probiotic supplement compares against all the others! Overall, I would say that Nature’s Bounty Probiotic 10 is a slightly above average probiotic. The things I like about it include the relatively low price, the high cell count (20 billion) and the diversity of different probiotic strains (10). When I tried it out, it also helped me kick a lingering cold that I’d had for over 3 weeks. So kudos for that! On the negative side, I did experience some stomach pain the first few days of taking the probiotic, but eventually it went away. Another concern I had with this product was that it contains milk ingredients. I would have liked to see a more allergy-friendly product, since so many people are lactose intolerant (and especially those who take probiotics). All in all, I think Nature’s Bounty Probiotic 10 is a pretty good supplement that may be taken therapeutically for some specific ailment. However, those with sensitive stomachs or any allergies to milk may want to look elsewhere. As the name suggests, Nature’s Bounty Probiotic 10 consists of 10 different strains of probiotics. Of note, the strain Lactobacillus Acidophilus has been shown to help alleviate digestive problems such as diarrhea, bloating, and gas. It can also help with other areas such as vaginal infections, inflammation, and even balance cholesterol levels! Probiotic 10 also contains Bifidobacterium Bifidum. We like this addition because studies have shown that it can boost your immune system, help your body fight off colds or the flu, and may even treat respiratory infections such as bronchitis or sinusitis. The proprietary blend in this product contains 20 billion cells per serving. With this cell count in mind and the abundant amount of probiotic strains, Probiotic 10 may be best used for specific ailments or diseases. Probiotic 10 almost hits all the marks when it comes to allergy concerns. The capsules contain no soy, gluten, wheat, fish, starch, sugar, or sodium. As a bonus, it’s also free of artificial colors, flavors, sweeteners, and preservatives. Unfortunately, the capsules do contain milk ingredients. This is a major disadvantage since notable portions of those taking probiotics are sensitive to milk. So if you are lactose intolerant, we wouldn’t suggest you take this particular probiotic. As a side note, this product also contains gelatin. Although gelatin allergies are not as prominent as dairy allergies, they are still of concern to some people. The price per day of using Nature’s Bounty Probiotic 10 comes in at $0.37, which ends up being slightly lower than average. 37 cents a day for a multi-strain probiotic, could be a great deal for your overall health and your wallet! To make this product an even better value, Nature’s Bounty often issues coupons for $3.00 off. Many online retailers will post the virtual coupon to be clipped right before you add the product to your cart. Also, stores such as Walgreens and CVS periodically offer buy 1 get 1 free on supplements, and this product applies! Common side effects of probiotics tend to be bloating and gas. During the trial period, I personally experienced stomach pain for the first 3-4 days of taking Nature’s Bounty Probiotic 10, but thankfully it seemed to have subsided after that. The pain was uncomfortable and I was happy when it went away, but it wasn’t anything extreme or unbearable. We didn’t see Nature’s Bounty offer a guarantee for its product, Probiotic 10, which was a slight disappointment. On the upside, retailers such as Drugstore.com, Amazon.com, Walgreens, and CVS do have their own product guarantees in place. In particular, Drugstore.com offers a standard 30-day return policy, but it does charge a $4.99 shipping fee along with any product return. To buy Nature’s Bounty Probiotic 10, click here.